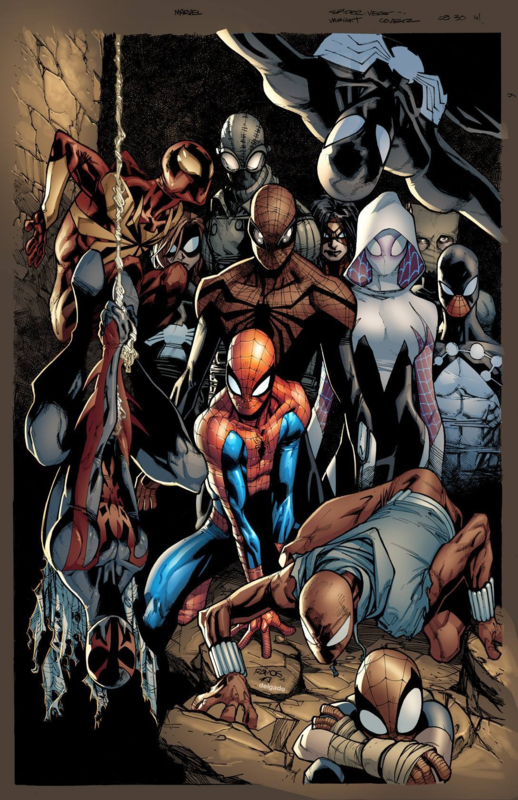 Starting up a faction thread for Spider-Verse and related Spider-Family units. The thought here is to use Swing Line and Web Swing as keyword powers to start building up some synergy. I've got quite a few Spider-related write-ups kicking around myself, but there are still a lot more out there. Master Weaver does not have a figure and cannot be placed on the battlefield. When an Army Card you control with the Swing Line or Web Swing special power has all of its figures destroyed, you may immediately remove any unrevealed Order Markers from that card and place them on any other card you control. You may draft two or more different Unique Army Cards that share a Secret Identity as long as all such Army Cards have the Swing Line or Web Swing special power. After revealing an OM on this card, instead of moving Spider-UK, you may choose 3 figures you control with the Swing Line special power or Web Swing special power. The chosen figures may immediately move with that special power. Once per round, you may choose either Spider-UK or a friendly figure within 3 spaces of Spider-UK and place that figure on this card. At the end of each round, you may place one figure on this card on the battlefield. Instead of his normal move, Spider-UK may use his Web Swing. Web Swing has a move of 2. When counting spaces for Spider-UK's Web Swing movement, ignore elevations. Spider-UK may swing over water without stopping, swing over figures without becoming engaged, and swing over obstacles such as ruins. Spider-UK may not Web Swing more than 40 levels up or down in a single Web Swing. If Spider-UK is engaged when he starts to Web Swing, he will not take any leaving engagement attacks. After using Web Swing 2, you may use it two additional times. After revealing an Order Marker and taking a turn with a figure you control with the Web Swing, or Swing Line special power, or an Avengers marker on it's Army Card, if Spider-Girl is within 6 Clear Sight Spaces of the chosen figure, you may take an immediate turn with Spider-Girl. You may not take any additional turns with figures you control. Before moving, you may choose an opponent's figure within 4 clear sight spaces of Spider-Girl and roll the 20-sided die. If you roll 11 or higher, that figure rolls 1 fewer defense die against Spider-Girl's attack this turn. Unfortunately, no minis for Spider-UK or Spider-Man India yet, but my thinking here is that Spider-UK is going to be sort of the classical synergy hub, Anya may be some kind of sidekick, and Spider-Man India is more of a support figure. (Spidey India is a techie even by spider-standards, and invented wrist communicators that the Web Warriors use, which I feel translates to a support power, maybe passing around glyphs). And then as a second category, potential synergy figures that aren't necessarily spider-people themselves, or at least certainly aren't the Swing Line type. At the start of the game, you may choose a Unique Hero you control to be Madame Web's Student. While there is at least one unrevealed Order Marker on this card, opponents cannot take temporary or permanent control of Madame Web's Student or move Order Markers off of the Student's card to a different card. Any time you roll the 20-sided die for a special power on a card you control during an opponent's turn, if there is at least one unrevealed Order Marker on this card, you may add 1 to the roll, or 2 to the roll if you're rolling for a special power on the card of Madame Web's Student. If a Crime Fighter you control is targeted for an attack by an opponent’s figure within four clear sight spaces of Mary Jane, roll the 20-sided die. If you roll a 7 or higher, the attacking figure’s turn immediately ends. If a figure you control moving with their Swing Line special ability passes over a space containing Mary Jane, at the end of that figure’s movement, place Mary Jane adjacent to that figure. Mary Jane will not take any leaving engagement attacks when moving with Passenger Swing. When Mary Jane is destroyed, you may place this figure on a Crime Fighter you control’s Army Card. That figure receives two wounds and rolls 3 additional attack dice as long as Mary Jane is on that Army Card. At the end of a round in which the chosen Crime Fighter took a turn, remove Mary Jane. Instead of her normal move, Arachne may use her Web Swing. Web Swing has a move of 2. When counting spaces for Arachne's Web Swing movement, ignore elevations. Arachne may swing over water without stopping, swing over figures without becoming engaged, and swing over obstacles such as ruins. Arachne may not Web Swing more than 40 levels up or down in a single Web Swing. If Arachne is engaged when she starts to Web Swing, she will not take any leaving engagement attacks. After using Web Swing 2, you may use it two additional times. When Arachne defends against a normal attack from a figure within 4 spaces, roll 2 additional defense dice if the attacking figure moved at least 1 space this turn. After Arachne rolls defense dice against an opponent's attack, if at least one blank was rolled, you may choose Arachne or a figure within 4 clear sight spaces of Arachne and place that figure on any unoccupied space within 4 spaces of its original placement. Figures moved by Psychokinetic Webbing never take leaving engagement attacks. -place a Web Shield Destructible Object from this card on the space Silk occupies, and place Silk on the Web Shield Destructible Object. If Silk is attacked and at least 1 skull is rolled, roll the 20-sided die. Subtract 1 from your roll for each figure Silk is engaged with. If you roll 8 or higher, Silk takes no damage and may immediately use her Web Swing 2 special power. Instead of her normal move, Silk may use her Web Swing. Web Swing has a move of 2. When counting spaces for Silk's Web Swing movement, ignore elevations. Silk may swing over water without stopping, swing over figures without becoming engaged, and swing over obstacles such as ruins. Silk may not Web Swing more than 40 levels up or down in a single Web Swing. If Silk is engaged when she starts to Web Swing, she will not take any leaving engagement attacks. After using Web Swing 2, you may use it two additional times. A figure occupying the Web Shield adds 1 to its Defense number, or 2 to its Defense number if it has the Web Swing or Swing Line special power. If a figure occupying the Web Shield receives one or more wounds, destroy the Web Shield. After Spider-Hulk rolls defense dice against a normal attack, you may roll the 20-sided die. Subtract 1 from your roll for each Wound Marker on this card. If you roll 12 or higher, Spider-Hulk may immediately move with his Swing Line 5 special power. If Spider-Hulk ends his movement adjacent to the attacking figure, you may roll an unblockable attack die against that figure. Instead of his normal move, Spider-Hulk may use his Swing Line. Swing Line has a move of 5. When counting spaces for Spider-Hulk’s Swing Line movement, ignore elevations. Spider-Hulk may swing over water without stopping, swing over figures without becoming engaged, and swing over obstacles such as ruins. Spider-Hulk may not Swing Line more than 40 levels up or down in a single Swing Line. If Spider-Hulk is engaged when he starts to Swing Line, he will not take any leaving engagement attacks. After revealing an Order Marker on this card and attacking normally with Spider-Hulk, roll the 20-sided die. Add 1 to your roll for each Wound Marker on this card. If you roll 17 or higher, you may use Spider-Hulk's Swing Line 5 and then attack again with Spider-Hulk. Spider-Hulk cannot roll for Spider Smash more than four times in a single turn. Before, during or after moving, Spider-Man may be placed on any empty space within 3 spaces of and lower than his current location, once per turn. When Spider-Man uses Glide 3, he will not take any leaving engagement attacks. When Spider-Man attacks an adjacent figure with a normal attack, the defending figure rolls 1 fewer defense die for each blank you roll. Figures attacked by this special attack can never receive more than 1 wound. If the defending figure received a wound from this special attack but is not destroyed, roll the 20-sided die for Paralysis. If you roll a 12 or higher, remove 1 unrevealed Order Marker at random from the defending figure's card and you may roll again for Paralysis. Figures without the Super Strength special power cannot roll defense dice against this special attack. If Spider-Man rolls at least one skull for this special attack, each skull rolled counts as one additional hit. Destructible objects are not affected by this special attack. Instead of his normal move, Spider-Man may use his Spider Glide. Spider Glide has a move of 2. When counting spaces for Spider-Man's Spider Glide movement, ignore elevations. Spider-Man may glide over water without stopping, glide over figures without becoming engaged, and glide over obstacles such as ruins. Spider-Man may not Spider Glide more than 40 levels up or down in a single Spider Glide. Whenever Spider-Man ends his movement 5 or more levels lower than his original placement, you may add 1 automatic skull to Spider-Man’s normal attack this turn if he attacks an adjacent figure. If Spider-Man is engaged when he starts to Spider Glide, he will not take any leaving engagement attacks. After using Spider Glide 2, you may use it two additional times. If Spider-Man did not move this turn, before attacking, you may choose a non-adjacent small or medium figure within 4 clear sight spaces of Spider-Man. Place Spider-Man adjacent to the chosen figure or place the chosen figure adjacent to Spider-Man. If Spider-Man attacks the chosen figure this turn, the chosen figure rolls 2 fewer defense dice. Figures moved by Web Slinger will not take any leaving engagement attacks. Start the game with 2 silver Armor Markers on this card. If Spider-Man is attacked and at least 1 skull is rolled, you may either remove an Armor Marker from this card or roll the 20-sided die, subtracting 4 from the roll if the attacking figure is a Symbiote. If you removed an Armor Marker or rolled a 15 or higher, Spider-Man takes no damage and may immediately use his Swing Line 4 special power. At the start of each round, before placing Order Markers, you may choose one special power on any Army Card. You may choose an additional special power if Spider-Man is adjacent to a Unique Hero you control that is an Engineer or Inventor. For the remainder of the round, figures cannot use the chosen special powers when attacked by Spider-Man. Instead of his normal move, Spider-Man may use his Swing Line. Swing Line has a move of 4. When counting spaces for Spider-Man’s Swing Line movement, ignore elevations. Spider-Man may swing over water without stopping, swing over figures without becoming engaged, and swing over obstacles such as ruins. Spider-Man may not Swing Line more than 40 levels up or down in a single Swing Line. If Spider-Man is engaged when he starts to Swing Line, he will not take any leaving engagement attacks. If a non-adjacent figure targets Spider-Man for an attack and rolls 2 or fewer skulls, you may ignore that attack. If a friendly figure within 3 spaces of Spider-Man is targeted for an attack, Spider-Man must immediately use his Swing Line 4 special power to move adjacent to the targeted figure, if possible. After Spider-Man uses his Swing Line 4 special power, the attacking figure must target and attack Spider-Man instead of the original target, if possible. Instead of his normal move, Spider-Man may use his Swing Line. Swing Line has a move of 3. When counting spaces for Spider-Man’s Swing Line movement, ignore elevations. Spider-Man may swing over water without stopping, swing over figures without becoming engaged, and swing over obstacles such as ruins. Spider-Man may not Swing Line more than 40 levels up or down in a single Swing Line. If Spider-Man is engaged when he starts to Swing Line, he will not take any leaving engagement attacks. When Spider-Man attacks, he may attack up to two additional times. Spider-Man may not attack the same figure twice in one turn. After attacking, you may either immediately use Spider-Man's Swing Line 3 special power, or roll the 20-sided die. If you roll 18 or higher, the defending figure receives one wound. When any player uses a special power on an Asgardian Army Card and rolls the 20-sided die to take control of Spider-Man, add 4 to the roll. After Spider-Man or an Asgardian you control with the Magical Defense special power rolls defense dice, you may immediately use Spider-Man's Swing Line 3 special power. Start the game with the Glpyh of Uni-Power on this card. When rolling to destroy the glyph of Uni-Power at the end of Spider-Man's turn, add 5 to your roll. While the Glyph of Uni-Power is on this card, if an opponent chooses Spider-Man for any special power and rolls the 20-sided die, you may subtract 4 from the roll. If Spider-Man is attacked and at least 1 skull is rolled, roll the 20-sided die. If you roll 10 or higher, Spider-Man takes no damage and may immediately move up to 4 spaces. Spider-Man never takes leaving engagement attacks when moving with Universal Senses. When a Unique Hero lands on this glyph, place it on that figure's card. When this glyph is on a figure's card, add one to that figure's Attack number, two to that figure's Defense number, and three to that figure's Range number. That figure also gains the Flying and Super Strength special powers. Spider-Man is considered to have the species of Mutant instead what is listed on this card. Common Human and Common Mutant figures adjacent to Spider-Man roll 1 fewer defense die to a minimum of 1 die. At the end of each round, roll the 20-sided die. If you roll 2 or lower, this special power is negated for the rest of the game. If Spider-Man is attacked and at least 1 skull is rolled, roll the 20-sided die. If you roll 12 or higher, Spider-Man takes no damage and may immediately either use his Swing Line 4 special power or, if the attacking figure is an adjacent small or medium figure, switch Spider-Man and the attacking figure. Switched figures will not take leaving engagement attacks. After attacking with this special attack, Spider-Man may immediately either attack with it one additional time or use his Acrobatic Leap special power. After Spider-Man or a figure you control within 3 clear sight spaces of Spider-Man rolls defense dice against an attack, Spider-Man may immediately use his Acrobatic Leap special power. If Spider-Man ends his Leap engaged with the attacking figure and was not engaged with that figure before leaping, roll an unblockable attack die against that figure. Spider-Man may use his Acrobatic Leap at any point before or during his normal move. Each time you Leap, you must first subtract 2 from Spider-Man's movement. His Leap has a move of 2. When counting spaces for Spider-Man's Leap movement, ignore elevations. Spider-Man may leap over water without stopping, leap over figures without becoming engaged, and leap over obstacles such as ruins. Spider-Man may not leap more than 12 levels up or down in a single leap. If Spider-Man is engaged when he starts to leap, he will not take any leaving engagement attacks. If Spider-Man is attacked and at least 1 skull is rolled, roll the 20-sided die. If you roll 12 or higher, Spider-Man takes no damage and may immediately use his Web Swing 2 special power. Instead of his normal move, Spider-Man may use his Web Swing. Web Swing has a move of 2. When counting spaces for Spider-Man's Web Swing movement, ignore elevations. Spider-Man may swing over water without stopping, swing over figures without becoming engaged, and swing over obstacles such as ruins. Spider-Man may not Web Swing more than 40 levels up or down in a single Web Swing. If Spider-Man is engaged when he starts to Web Swing, he will not take any leaving engagement attacks. After using Web Swing 2, you may use it two additional times. A player may only take a turn with Spider-Man after revealing an Order Marker on this card. After attacking an adjacent figure with Spider-Man’s normal attack, if Spider-Man inflicted at least one wound, you may attack an adjacent figure again with Spider-Man’s normal attack. You may continue attacking adjacent figures until you do not inflict any wounds, to a maximum of 3 total attacks in a single turn. After taking a turn with Spider-Man, reveal and remove one numbered Order Marker from this Army Card for each figure Spider-Man destroyed this turn that was not a Destructible Object, Android, Construct or Undead. Start the game with a Glyph of Web-Shooter and a Glyph of Spider-Tracers on this card. Spider-Man cannot lose these glyphs by receiving wounds unless he is destroyed. At the start of the game, you may choose one other Unique Hero you control and place a white Avenger Marker on its Army Card. After revealing an Order Marker on the Army Card of a Unique Hero you control that has an Avengers Marker on its card and before taking a turn with that Hero, you may take an immediate turn with Spider-Man. During this turn, Spider-Man can only attack figures engaged with that Hero. After taking a turn with this special power, you can not take any additional turns with other figures other than that Hero. If Spider-Man is attacked and at least 1 skull is rolled, roll the 20-sided die. Subtract 4 from the roll if the attacking figure is a Symbiote. If you roll 11 or higher, Spider-Man takes no damage and may immediately use his Glyph of Web-Shooter. Instead of moving this figure normally, you may choose a large or huge figure or destructible object that is within 4 clear sight spaces of this figure. Place this figure on any unoccupied space that is on or within 2 spaces of the chosen figure or destructible object. When moved with this glyph, this figure will not take any leaving engagement attacks. When this glyph comes into play, place 3 red Tracer Markers on this card. After taking a turn with this figure, you may choose an opponent's figure within 4 clear sight spaces and place a Tracer Marker from this card onto that figure's card. After a figure you control uses the Swing Line special power, Web Swing special power, or the Glyph of Web Shooter, it may use that special power or glyph one additional time, if it ends its move engaged with a figure that has one of your Tracer Markers on its card. At the start of the game, you may choose a Unique Hero you control. While Spider-Man is in play and there is at least one Order Marker on this card, the chosen Hero has the class of Celebrity in addition to what is listed on its card. Common Human figures adjacent to a Celebrity you control roll 1 fewer defense die to a minimum of 1 die. If Spider-Man is attacked and at least 1 skull is rolled, roll the 20-sided die. Subtract 4 from the roll if the attacking figure is a Symbiote. If you roll 13 or higher, Spider-Man takes no damage and may immediately use his Swing Line 4 special power. After Spider-Man rolls defense dice against an attack, he may immediately use his Swing Line 4 special power. If he is adjacent to the attacking figure after using Swing Line 4, roll an unblockable attack die against the attacking figure. If the figure receives a wound from this special power, remove a Wound Marker from this Army Card. If an opponent's Unique Hero would be destroyed by Spider-Man's normal attack, instead of destroying it normally, place all wounds from the attack on that figure's card and remove up to 2 Wound Markers and all Order Markers from that card. If that figure has enough wounds to be destroyed, destroy it. Otherwise, take control of that figure and its Army Card. That figure's species is now Undead instead of what is listed on the card, and it must use the Zombie Infection special power. When Zombie Infection refers to Spider-Man, it refers to that figure as well. Zombie Infection never affects Undead, Androids, Constructs, or destructible objects. When a figure you control chooses a Unique Hero for the Experimental Cloning power, instead of choosing a single Unique Hero, you may instead choose all Unique Heroes you control that have this special power. Instead of his normal move, this Spider-Man Clone may use his Swing Line. Swing Line has a move of 4. When counting spaces for this Spider-Man Clone’s Swing Line movement, ignore elevations. this Spider-Man Clone may swing over water without stopping, swing over figures without becoming engaged, and swing over obstacles such as ruins. this Spider-Man Clone may not Swing Line more than 40 levels up or down in a single Swing Line. If this Spider-Man Clone is engaged when he starts to Swing Line, he will not take any leaving engagement attacks. This Spider-Man Clone never takes falling damage and is never attacked when leaving an engagement. After rolling attack dice for a normal attack or after rolling defense dice, for each shield rolled you may immediately move this Spider-Man Clone one space up to 6 levels up or down. At the start of the game, you may choose a Peter Parker you control that is a Crime Fighter. For the entire game, Spinneret may use any special powers on the chosen Peter Parker's card. When you roll the 20-sided die for Spinneret or the chosen Peter Parker, subtract 1 from your roll if both figures are on the battlefield, or 2 from your roll if they are adjacent to each other. After revealing an Order Marker on the card of any other Unique Hero you control that has the Swing Line or Web Swing special power and before taking a turn with that Hero, you may take a turn with Spinneret. If you do, you may not take any additional turns with any figures other than that Hero. Before attacking with Spinneret, you may choose one other Unique Hero you control within 4 clear sight spaces of Spinneret that has the Swing Line or Web Swing special power. After Spinneret attacks, she may attack one additional time for each Wound Marker on the chosen figure's Army Card, up to a maximum of three additional attacks in a single turn. Bio - In a world where Peter Parker and Mary Jane remained married and raised a daughter, Mary Jane eventually ended up becoming a superhero herself. Using technology appropriated from the supervillain Regent, MJ is able to replicate her husband's powers, albeit at the cost of slightly diminishing them. She fights crime alongside Peter and Annie, their spider-powered daughter. If Spider-Man is attacked and at least 1 skull is rolled, roll the 20-sided die. Subtract 1 from the roll for each figure Spider-Man is engaged with, or 5 from the roll if the attacking figure is a Symbiote. If you roll 10 or higher, Spider-Man takes no damage and may immediately use his Web Swing 2 special power. Spider-Man has the secret identity of Peter Parker in addition to what is listed on this card. Spider-Man may add 2 to his range when attacking a figure whose base is no more than 4 levels higher than his height or 4 levels lower than his base. Add 1 to Spider-Man's Attack number for each figure he is engaged with. After Spider-Man attacks, if he did not roll any blanks, he may attack again. Spider-Man may not attack more than four times in one turn. Lastly, here's a smattering of other spider-types that are particularly significant or have minis available. Last edited by Ronin; March 4th, 2019 at 11:00 AM. But I know my son will be excited for a lot of them. Agent Venom is really high on my list, too. His book was the one that really got me into comics in a big way, and he's remained a favorite of mine. Oh man, I knew I should have picked up that Spider-Ham squinky figure. lucky for me my son hasn't seen these...He still enjoys squinkies...ironically that is what lead us to C3G. He started exchanging Squinkies for pieces in every board game he played (keep in mind those days he was like 4 and the games were candy land and chutes and ladders). I started looking for Super Hero games he could play since he was addicted to Super Hero Squad. What's the price point and scale like on those things? There's a Spider-Ham Heroclix, but it's fairly pricey ($10-15), and not too common. Man, I have seen this one custom Spider UK so many times that I actually thought it was an actual Heroclix! It must be pretty easy to do. FWIW, I have the future Spider-Man, Old Man Spider, and a couple others of those, if you end up needing pics. Just let me know. Cool. I'm hoping WizKids will put out some more Spider-Verse minis before too long and we won't have to resort to customs - I was really shocked when we got as little as we did in the Superior Foes set. These packs are typically $10-$12 and come with about 6-10 figures. Most would be useless as they are tiny but the Spider-Ham would probably be about right sized. They are cartoony compared to Clix but again that works for Ham. Hmm. Might be a better choice than the Ham Heroclix, then. I'll have to keep an eye out. I picked up a bunch on clearance. I had planned to run a Shrinking Ray Gun game, where the only characters would be ones I had Squinkies for, to switch when shrunk. Oh that's a great idea...I'm stealing that for our next game night.